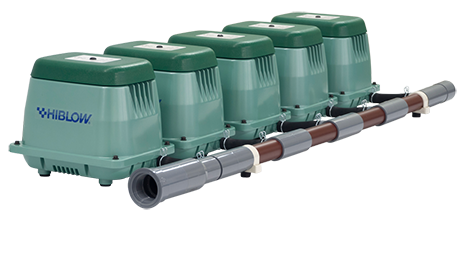 Why do most Aerobic Treatment Unit (ATU) manufacturers supply HiBlow linear air pumps with their onsite wastewater treatment systems? Four main reasons: our quality, reliability, performance, and availability. In many onsite installations, the air pump is the septic system’s only moving part. So it must be dependable. HiBlow pumps work 24 hours a day, every day of the year. They set the industry standard for reliability and service life. We design, engineer, and manufacture all HIBLOW pumps in our own facilities. We don’t buy pumps from other companies and re-brand them. And we don’t use contract manufacturers. Every HIBLOW linear air pump is fully tested and certified for quality in your application before it is packaged and shipped to you from one of our factories. If you read closely, the warranties for most competitive pumps don’t cover the diaphragms. We do. After all, what good is a warranty if it doesn’t include the working parts? HIBLOW residential models are below 36 dBA. Larger commercial units are under 48 dBA. Whether installed right next to the patio, or even indoors, your customer won’t complain about noise. To purchase a HIBLOW pump, please contact us for your closest, or most convenient distributor. 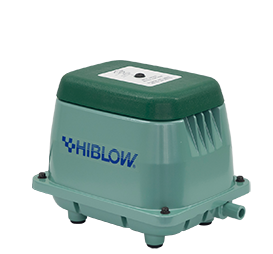 If you are unsure which HIBLOW pump model you need, please contact your treatment system manufacturer. Available with integral low-pressure alarms. Manifolds for connecting multiple HIBLOW HP Series pumps in parallel for higher flows. Enables connection of up to 5 pumps in parallel with a single exhaust port.